Located adjacent to Disneyland®, fun, excitement and fright in abundance can be found at Disney’s California Adventure Park®. 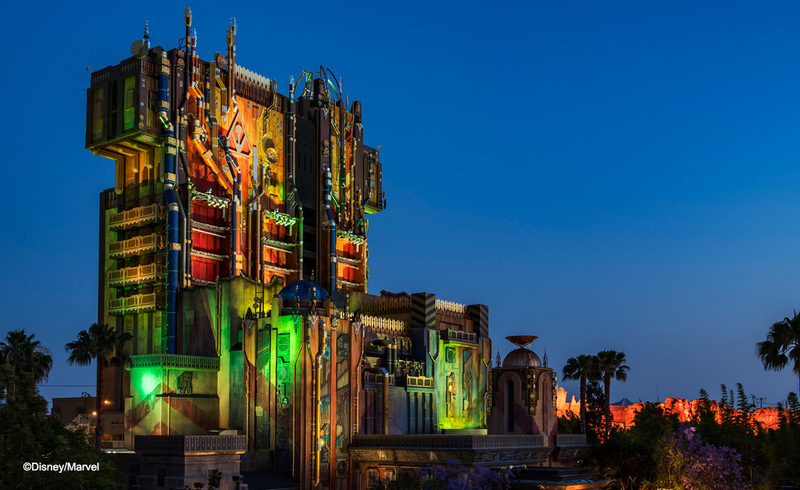 Experience firsthand the Gradians of the Galaxy – Mission: BREAKOUT! ©Marvel if you’re brave enough, or take a wild ride on the terrifying rollercoaster, Pixar Pier’™. If it’s thrills you are looking for, you’ve come to the right place! However, there is plenty of fun to be had without terror as well with the Animation Academy™, Grizzly River Run™, Jumpin’ Jellyfish™, Sorcerer’s Workshop™, and of course, the magical fun with Woody and Buzz on the Toy Story Midway Mania™! Dining options are also in abundance at Disney’s California Adventure Park with favorites like the Ghirardelli® Soda Fountain and Chocolate Shop, Taste Pilot’s Grill, Clarabelle’s, Flo’s V8 Café and the Fillmore’s Taste-In with multiple cousines. There are options to please even the pickiest eater, and all with a touch of magic inside. And of course, entertainment is also in abundance here with exciting shows like Aladdin-A Musical Spectacular and the amazing World of Colors light show in the evening. Keeping the magic alive during your Magical Kingdom vacation is something that our Anaheim hotel understands, and we aim to please with a magical setting and a prime location, making our Disneyland® hotel the best choice for your trip. With numerous dining, shopping and entertainment options only a short walk away, everything you need can be found in just a few minutes at our convenient Anaheim hotel near Disney’s California Adventure Park®!